Digital Program box for SeaKing Marine Esc's, EZ Run Car Esc's and Hobbywing v2 car esc's. Programs Seaking and Leopard Branded Seaking 60, 90, 120, 130HV and 180 amp esc's. ProBoat ESC 120A BL Marine ESC 2-6S (DYNM3875) Allows for quick and easy programming without needing to use the transmitter. 1. There are 2 control wires on the ESC, the long one is used to connect to the receiver, the short one is used to connect with program box. 2. You must supply the program box with an additional battery because the Seaking-130A-HV ESC has no bulid-in BEC. 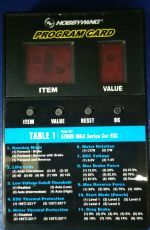 a. Connect the program box with the ESC through the programming wire (shorter wire). b. Connect the battery pack (4.8V to 6V) to the Program box. Box will light up with " - - - "
c. connect main battery pack to the ESC. A few seconds after you plug in the main batteries the " - - - " lightings will switch to "1 1"
IMPORTANT! Steps a to c cannot be reversed. (1) adapter wire for programing a Version 3 Seaking or Leopard V3 esc. As of 1/1/2016 this card has the three program tables printed onto the card.